One of the most common items that people require storage for is a mattress. 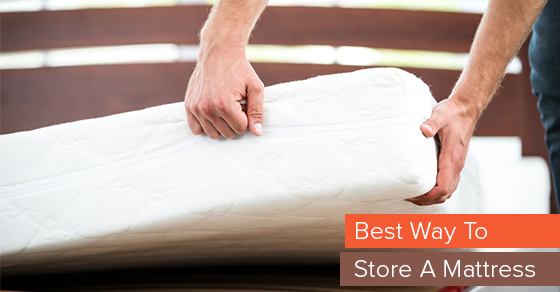 When trying to store a mattress, many people opt for a basement or below-ground storage areas. This is a recipe for disaster, because basements are humidity traps and a mattress can quickly become so damaged by mold and mildew that it is no longer useful. Anything made of fabric should be thoroughly cleaned before putting it away into temporary or long-term storage. If you put your mattress into storage without cleaning the dirt, dust and grime off of it, this debris can ingrain itself even further into the fabric and you might find yourself with a mattress that looks so ratty that nobody is going to want to use it, or even take it as a donation. Get a light, breathable mattress cover for your mattress before storing it. You can pick up a breathable, plastic cover for around twenty dollars and it will go a long way to ensuring that your mattress is protected while in storage. Make sure that you secure the cover with some tape, and cover any holes in the cover (if you are using an old one you have lying around). Many people say to store that mattress upright against the walls of your storage unit, but if you can spare the horizontal space, your best bet is to store it flat on the ground so that the springs and coils are not under the constant weight of the mattress. If you store a mattress upright, or on its side for too long, the constant pressure can warp the mattress, and you will end up reusing or donating a mattress that is going to be incredibly uncomfortable to sleep on and may even end up causing you back problems. A self-storage unit is always a convenient place to store an old mattress, and climate controlled units are even better. If you are trying to get an old mattress out of the way, or even a new one that you have recently purchased that you don’t quite know what to do with yet, keep the above mattress storage tips in mind and ensure that your mattress is well protected while in storage.